Couva South Member of Parliament Rudranath Indarsingh is challenging Labour Minister Jennifer Baptiste-Primus to provide documentary evidence to substantiate her allegations that the On the Job Training (OJT) scheme were allegedly plagued by “ghosts” employees during the tenure of the People’s Partnership Government (PPG). Indarsingh was reacting to Baptiste-Primus’s comments which she made at the Labour Ministry’s launch of its new website on Friday last. Indarsingh said that thirty-one months after being elected into office, members of the Keith Rowley-led PNM Administration continue to hide behind allegations and innuendoes against the former PPG simply to mask and cover their incompetence and inability to govern the country. 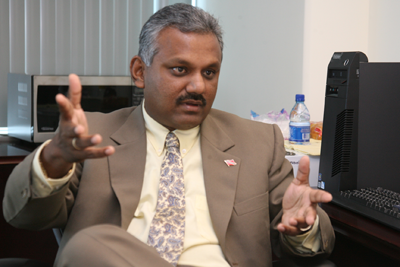 Indarsingh said that while Baptiste-Primus made these unsubstantiated allegations against the previous Administration, she confirmed that under her stewardship as Labour Minister, ghost-employees are very much present within the Rowley-led PNM Administration and called on her to produce the documentary evidence against her own Government. He calls the allegations from Baptiste-Primus another political attempt at diverting public attention from real-issues facing the country. He said the country is saddled with a comatose Government which has embarked upon blatant schemes designed to continually distract attention from the its many scandals and shortcomings. According to Indarsingh, Baptiste-Primus is not the first Cabinet Minister of the Rowley-led Administration to make this claim. In 2016, Attorney General Faris Al-Rawi also made the same allegations about ghost-employees operating in the office of the Ministry of the Attorney General and he too failed to provide any type of documentary evidence to backup his statements and allegations. What is the status of the joint Memorandum of Understanding signed between the PNM and the labour movement prior to the September 2015 General Elections? Has the Minister attempted to assist the business owners in Tobago with the crisis that has engulfed the Seabridge, a crisis that her Government created and just doesn’t seem to be able to get out of? What is the status of the amendments to the Retrenchment and Severance Benefits Act and the Industrial Relations Act which the Minister promised to bring to Parliament? Indarsingh said that instead of drumming up fake news and misinformation to hoodwink the population and conceal its incompetence, Minister Baptiste-Primus should be showing some type of leadership in dealing with the plight of of the working class in the country instead of allowing these workers to be subjected to continual retrenchment, restructuring and downsizing. Ministers Moses and Dillon: What are you doing for our Cedros fishermen?